Google Hangouts is getting a big update today that all users of the social messaging app will want to get hold of for their Android phone, tablet and wear devices. The updated version 4.0 is expected to be released to the Google Play Store today and with it comes a streamlined look and feel, simplified controls and improved speed. Google indicated on their blog today that the new Google Hangouts will be available today and has started to roll out. If you are not seeing it on your devices, give it time. It will take a bit of time to hit everyone. 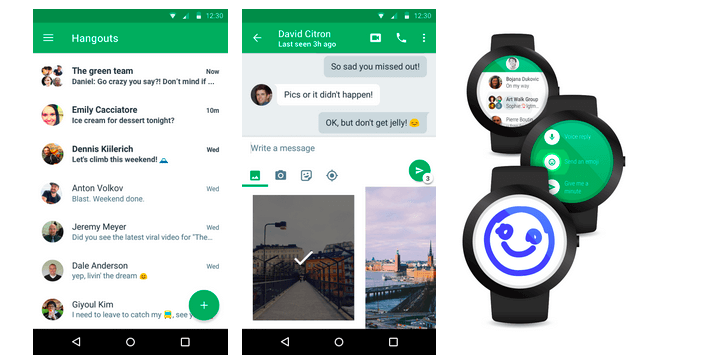 Personally I am particularly interested in the Android Wear integration of the new Hangouts. I have found using the current 3.3 version on my Moto 360 to be solid but based on the photos that Google released with the blog post, it looks like it is going to be a cleaner and easier interface to use on these devices. If you already have Google Hangouts installed on your Android phone or tablet, the v4.0 update will come to you automatically through the Google Play Store update on My Apps. If you haven’t tried the app, use the link above the break or tap the Google Play Store button below to download it to your devices. If you download the 3.3 version, don’t fret. You’ll get updated to 4.0 when it rolls out.